OK, brainstorm. What words come into your head when you hear the phrase “heavy metal”? I’m guessing: long hair, leather and denim, groupies, volume knobs that go up to 11, terrible migraines, that kind of stuff. And their likely choice of drinks? Vodka, Jack Daniels, strait 100% proof alcohol ingested intravenously? Well it seems that they’re more likely to let their extensive hair down with an effete glass of rosé, because this one tightly-defined area of the entertainment industry appears to be the most tightly linked with wine. The evidence? Well, this Thursday AC/DC’s own brand of wine, with labels including Highway to Hell Cabernet Sauvignon and You Shook Me All Night Long Moscato, goes on sale in their native Australia. “This is a world-wide phenomena and a first in the marketplace,” somebody involved roared. 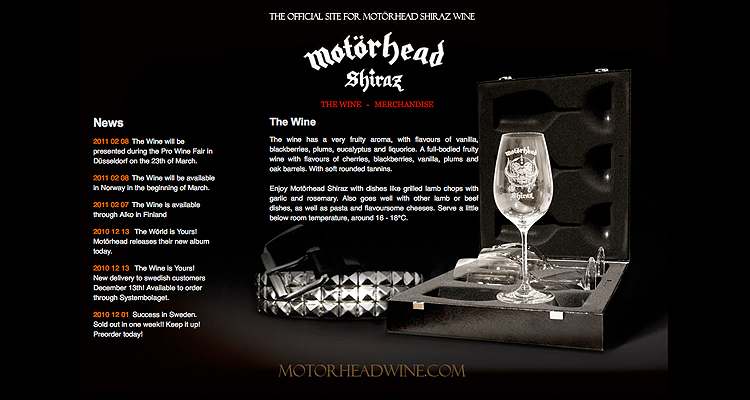 This comes just months after the launch of Motorhead Shiraz – “A full-bodied fruity wine with flavours of cherries, blackberries, vanilla, plums and oak barrels, with soft rounded tannins,” we were told. “Enjoy with dishes like grilled lamb chops with garlic and rosemary.” Phew, rock ‘n’ roll! Iron Maiden beat them all to it, releasing Eddie’s Evil Brew – a Chilean merlot – in 2008, while the lead screamer in Norwegian “black metal” (shudder) outfit Satyricon released his own range in 2010 (a barolo among them) – “I have made wines that I am proud of,” he grunted – and the winery owned by Maynard James Keenan from Tool was the subject of the recent film Blood Into Wine. Then there’s Metallica wine glasses, Bon Jovi Slippery When Wet Cabernet Sauvignon (best not drunk with this soundtrack), a Led Zeppelin guitar solo-and-wine-matching dinner (sample matches: The Song Remains the Same and Champagne; Black Dog and malbec), and Randy Rhoads Cabernet Sauvignon, the wine named after Ozzy Osbourne’s deceased ex-guitarist which was served backstage at all of Ozzy’s dates on this year’s US tour. Plus Nightrain, Guns ‘n’ Roses 1989 No17 smash, which was named after a cheap brand of wine (and there’s evidence that their singer, Axl Rose, kept drinking wine after he became famous). And – a weird coincidence this – not only is wine often found in heavy metal, but heavy metals are often found in wine. But the main link between heavy metal and wine, of course, is that too much of either will leave you with a headache.